Announcement Thank you so much for supporting my Etsy shop and my lettering dreams! ✏️ Every item you receive is handlettered by me with care. Thank you so much for supporting my Etsy shop and my lettering dreams! ✏️ Every item you receive is handlettered by me with care. This is a full wedding set. This is a custom order so please feel free to contact me and let me know the details of your event so that I may provide a custom quote for you. 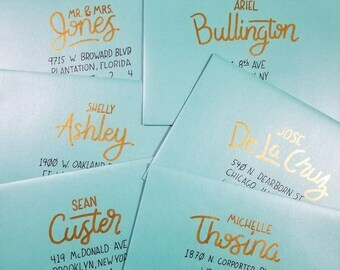 Metallic Teal Envelopes on metallic teal with custom gold handlettered ink/paint. An Invitation set on metallic teal with custom gold handlettered ink/paint. Table cards and RSVP's with custom gold hand-lettered ink/paint. Bringing people happiness through lettering. I started lettering as a hobby in 2015 and it has turned into a passion of mine something that I do every day because I love it. I have a background in graphic design and have been a designer since 2010. I decided to turn this passion into something I could share with others. Hopefully making someone else as happy as I am making something for them. I never took any classes for lettering I just picked up a pen and tried over and over. Practice definitely makes progress. 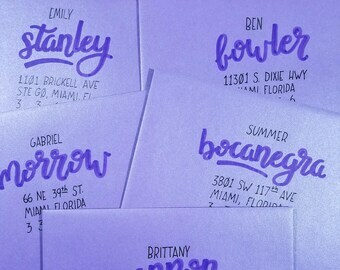 My lettering has a modern touch with clean lines. If you're looking for something original and something to call your own I think you have come to the right place. 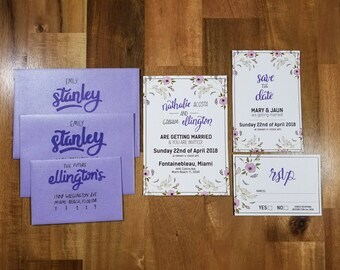 I wanted to start with wedding invitations and announcements because I wanted to make people even happier for their happiest day. I wanted to provide people with something that I feel others don't and that's to provide everything you need all in one place. I started lettering as a hobby in 2015 and it has turned into a passion of mine, something that I do every day because I love it.